The Southern Ocean surrounding Antarctica accounts for nearly 40% of the global oceanic sink of anthropogenic carbon dioxide emissions. Understanding the mechanisms that regulate this carbon sink is fundamental in forecasting impacts on the Earth system under future climate change scenarios. The ocean’s ‘biological pump’ is integral to this carbon sink and consists of phytoplankton assimilating carbon dioxide into organic matter through photosynthesis. Iron is essential for the growth and productivity of phytoplankton and where it exists in deficient concentrations, such as the Southern Ocean, it controls the efficiency of this pump. The overall aim of this project will be to assess the bioavailability of different iron sources and what effect these have on microbial growth. To achieve this, you will study iron availability from different end-member samples (e.g. glacial/sea-ice, seawaters and sediments) and, in conjunction with other oceanographic data (e.g. light/irradiance), form a better understanding of microbial responses to iron availability in this globally important region. 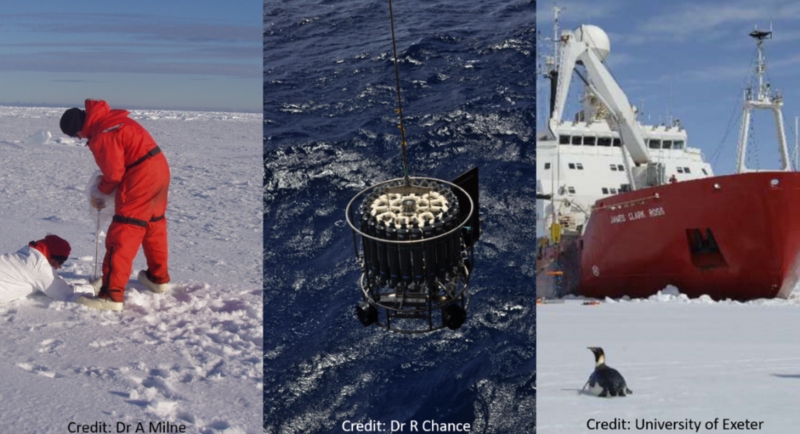 This project will provide an exciting and rare opportunity to study the transport and bioavailability of iron in the Southern Ocean and become part of a UK team studying this region as part of the NERC RoSES research programme. Using clean handling techniques, you will collect seawater, particulate matter, glacial- and sea-ice samples during a shipboard expedition to Antarctica. Through bioassay experiments, the response of the in-situ microbial community to different iron sources will be investigated. To assess iron availability from collected particulates, in a shore-based laboratory you will perform sequential leach-digestions that you will analyse using Inductively Coupled Plasma-Mass Spectrometry (ICP-MS). You will become an expert trace-metal marine biogeochemist. In world class laboratory facilities in Plymouth and Oxford, you will receive comprehensive training in clean handling and advanced analytical techniques which will be required to perform radiotracer bioassay experiments and respective analyses. We are looking for a highly self-motivated graduate with a BSc or Masters level degree in Earth, Ocean or Environmental Science, or Chemistry (or similar). You will be inquisitive and enjoy problem-solving with a genuine passion for marine science. Milne, A., Schlosser, C., Wake, B., Achterberg, E. P., Chance, R., Baker, A., Forryan, A. and M. C. Lohan (2017). Particulate phase interactions are key in controlling dissolved iron concentrations in the (sub)-tropical North Atlantic. Geophysical Research Letters 44: 2377-2387. DOI: 10.1002/2016GL072314. Birchill, A., Milne, A., Woodward, M., Harris, C., Annett, A., Rusiecka, D., Achterberg, E. P., Gledhill, M., Ussher, S. J., Worsfold, P. J. Geibert, W., and M. C. Lohan (2017). Seasonal iron depletion in temperate shelf seas. Geophysical Research Letters 44: 8987-8996. DOI: 10.1002/2017GL073881. Bouman H. A., Lepere C., Scanlan D. J., Ulloa O. (2012). Phytoplankton community structure in a high-nutrient, low-chlorophyll region of the eastern Pacific Subantarctic region during winter-mixed and summer-stratified conditions. Deep Sea Research I 69: 1-11. DOI: 10.1016/j.dsr.2012.04.008.